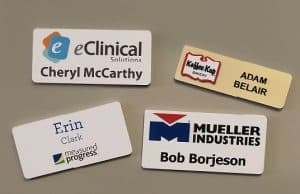 Turn your corporate logo or artwork into gorgeous full color name badges that will make you stand out from the crowd! Budget friendly and fast turnaround ~ No minimum quantity and all work is done in-house. 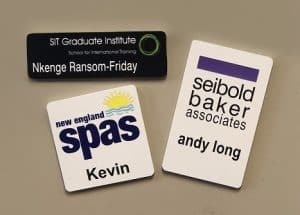 Simply send us your artwork in a compatible format (.eps, .ai, .bmp, .tif or .pdf) and via the sublimation process (the same process used in offset printing) we will transfer your image(s) and text into full color name badges with brilliant colors and clear crisp text. Complete PMS color matching ~ simply send us the corresponding Pantone numbers to the colors in your logo or artwork. 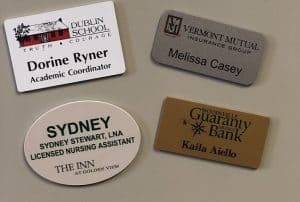 A variety of attachments ~ pin back, magnetic back, clutch back, swivel clip, lanyard or luggage tags. Badge frames are also available for an added extra touch. Plastic frames plated for durability and appearance ~ available in bright gold or silver finish. Questions? Email sales@granitestatestamps.com for more details.